Peanut/groundnut oil is a healthier and a better product than most other oils, however, most cooking oils you buy in stores today are processed using solvents or pressure, or both. So why not make your own peanut oil with a much healthier method? It does not take much effort for making peanut oil at home. Start making and eating healthy oil today! ★ Well dried and deshelled the peanuts/ groundnuts. 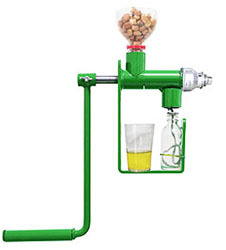 ★ Assembled your hand crank peanut oil press properly and mount it on a sturdy surface. ★ Preheated the press cage for about 10 minutes before expelling. ★ Feeding prepared peanut seeds into the feed inlet slowly and carefully and at the same time turn the crank of the expeller press to start making oil. ★ Let the oil in the bottle for 24 hours or so to let natural particles settle down. ★ Pour off the oil in a clean glass jar or bottle for later use. Note: The oil may have a cloudy appearance due to natural particles. Commercially processed oils have removed any natural matter in the refining process. It is not harmful to use the oil with these particles. 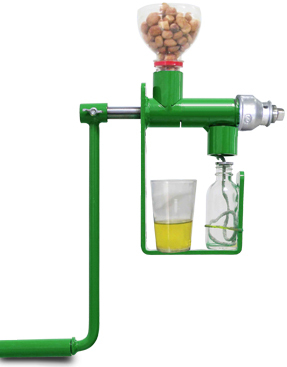 If you want to make fresher and healthier peanut oil, our new manual screw type peanut oil press is your best choice! With years' experience of manufacturing and exporting oil press machines, we have already have steady business all over the world and our clients are very satisfied with our products. If you are looking for peanut oil making machine for business uses, we can also provide it at factory low price! ★ Allow free flow of the press cake and tighten the terimal adjustment bolt gradually until the press cake appears as thin strings. ★ Turning of the screw goes fairly lightly. 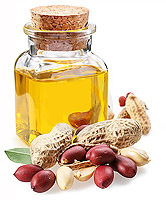 Make your own peanut oil by yourself and have a healthy life today! 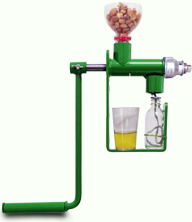 For any further information about our small peanut oil press machine, please kindly let us know. We are always ready to help.